When sixteen-year-old Laura Ratliff wins a walk-on role (with a plus-one!) thanks to a radio call-in contest, she is more relieved than excited. Mingling with Hollywood stars on the set of a phony nuclear war is a perfect distraction from being the only child in her real nuclear family—which has also been annihilated. Her parents are divorced, and her mother has recently remarried. Her father, an officer in the Strategic Air Command, is absent . . . except when he phones at odd hours to hint at an impending catastrophe. But isn’t that his job? "Though the story takes place in the '80s, it feels eerily timely." "[Brashear] mixes the real and fictional and then gives the mix an extra twist." "With steadily rising tension, plenty of high jinks and a steady stream of fun ’80s pop-culture and music references—many of which are lovingly and hilariously explained in footnotes for today’s Gen Z teen readers—Brashear’s story is a surefire winner." "Brashear ably balances dark humor and convincing dread." "This tragicomic story of Laura and her motley crew is a page-turner from start to finish . . . A clever, superbly written, laugh-out-loud-hilarious story within a story and movie within a movie about nuclear war anxiety in small-town America. 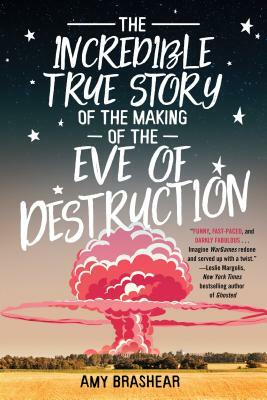 You might not learn to love the bomb, but you will love this book." "This snarky and insightful historical novel will ring true with many young adults. A strong pick for YA shelves." "Brashear sprinkles the novel with information about the '80s, offering a nuanced sense of time and what it felt like to grow up under nuclear threat . . . In this moment where what constitutes fact is up for debate, Brashear's seemingly nostalgic romp is extremely timely." "A must read . . . carefully researched." "Gripping and fast-paced, this meticulously researched historical fiction will reinvigorate a new generation to Capote and tell another side of the Clutter murders." "Brashear’s stunning YA novel is as spectacularly written as it is researched. This is definitely one of the most unique YA novels you’ll read this year."